Rev. Yuguda gives food to needy families. Director of the Nigerian Disaster ministry, Rev. Yuguda Mdurvwa, reports that the team is continuing with food distributions. 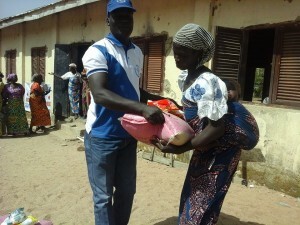 The following pictures (provided by EYN) are from a distribution near Michika in the village of Munni. Medical assistance was also made available. Violence continues in the regions nearest the Sambisa Forrest where Boko Haram still has a foothold. 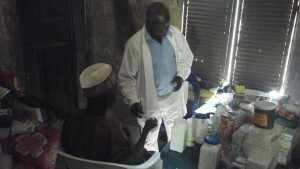 Medical personnel see patients and give medicines. 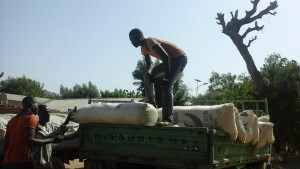 Relief workers unload bags of grain. 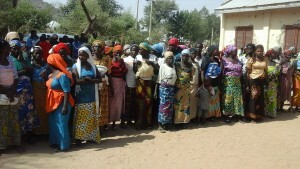 Women wait in line to receive food supplies. I’d like to talk a bit about what pushed me to join BVS, and how my journey before and during BVS has affected my understanding of God and what it means to be the Church in the world today. I had grown up at Oak Grove Church of the Brethren in Roanoke with a loving family and church community. But something changed when I left for college at James Madison University. I became detached from the daily life of living with family at home and was removed from my community at Oak Grove. Much of the immediate stability that had defined my life was in an instant vanished. My first two years of college became a time where what I started to study and believe were in open rebellion to my previous 18 years of existence. As I began to find meaning in new places and even question what I had believed about God and the church, my head felt divided. What I was learning, wasn’t adding up with how I’d thought and lived before college. This was a confusing time for me because in one breath I’d be having conversations with folks where I’d be condemning the shortcomings of religion and the impossibility of many of the biblical stories, and in the next I’d catch myself yearning to understand the Lord’s precepts like the Psalmist in Psalm 119. I started taking classes in religion where I filled my head with knowledge of how the Bible was formed, how Christian beliefs developed over the years, and how Christianity compared to the other religions of the world. I was fascinated by it all, but my actual life hadn’t changed a bit, let alone been transformed. It wasn’t until my Senior year, that things radically came into focus for me. 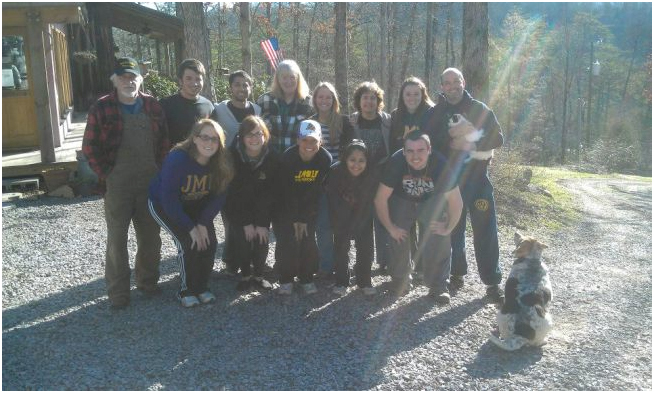 And it didn’t happen in one of my super academic classes or even at a church, but rather it occurred on a spring break trip where I headed to the mountains of Tennessee leading a group of 10 college students on a service trip through our university’s Alternative Break Program. Throughout the week we worked and lived in the Cherokee community in the Smokey Mountains on the border of North Carolina and Tennessee. We built steps, cleaned up creeks, looked after children, cared for seniors, and got to immerse ourselves in the Cherokee way of living. Our trip, however, would not continue as planned because life got in the way, as it often does. 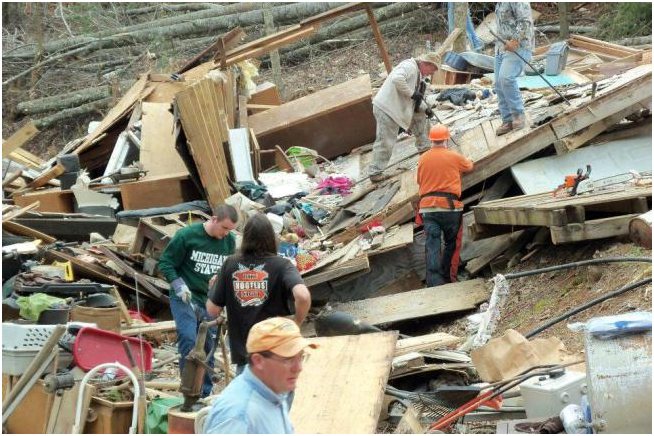 For the second half of the week we had to totally shift gears due to tornadoes that had wreaked havoc through parts of southeastern Tennessee. 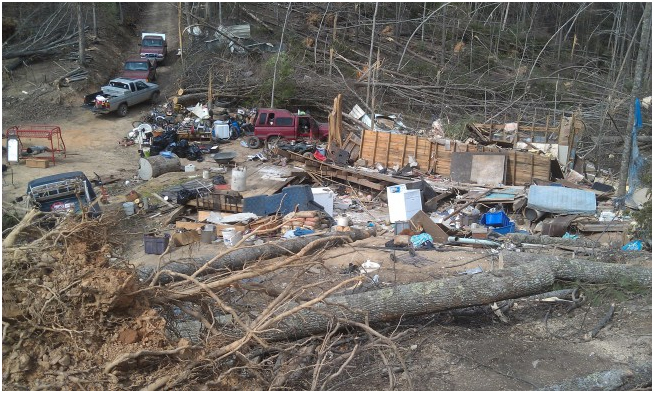 We traveled far back into the Smokey Mountains near Tellico Plains, Tennessee, to get to the affected area. Our group was chosen to go even farther back into the hollow of the mountain to help a man named Daniel who had been one of the worst hit. It took quite a while to make it up the winding road’s switchbacks and when we reached Daniel’s steep declining driveway, we had to hold on for dear life as we bounced and bumped down the hill towards his property. We were all laughing and smiling as the ride down the driveway felt like a ride on a roller coaster, but once we reached the bottom of the drive, the van fell silent. The devastation was unspeakable. The land looked like a trash dump where local residents came to leave their garbage, but no, the truth was, that less than 24 hours ago Daniel and his family had been living happily in their home that now lay strewn across the earth. We were all unsure of how to properly speak or help, as we felt inadequate in the face of such terrible tragedy. Daniel was an intimidating looking man. He was tall and had broad shoulders and had a long dark beard that reached to his waist. He walked with a cane and I later noticed this was because he had a rudimentary prosthetic foot. None of us moved or spoke for a minute, but our immobilization did not last as Daniel and some of his close friends approached and greeted us with handshakes and hugs. Hidden underneath Daniel’s big beard was a bright big smile that quite frankly surprised us. Daniel couldn’t believe that a bunch of strangers from hours away cared enough to show up to his rural mountain home to help him pick up the pieces of his life. He wanted to know where we were all from, how we came to find ourselves in Tennessee, and he kept up this small talk throughout the day. He told us about his children and about how he loved to ride his Harley Davidson motorcycle through the mountain curves we had just driven through. And we actually uncovered one of his old Harley engines in the wreckage. Me (green shirt) working and talking with Daniel (black shirt). I told him about growing up in Roanoke, my family back home and then about my college and what I was studying. It was as if we were making chit-chat before church or while we waited in line to buy a coffee. We even were lucky enough to share a meal with him and his friends out of the little food that we all had. You would’ve thought we were eating at a 5 star restaurant in downtown DC the way everybody gobbled it up and abundantly thanked us. His upbeat attitude perplexed me. Calamities such as the events that Daniel and his family experienced were the exact sort of thing that had disturbed me when trying to reconcile my faith in a loving God with the chaotic world around me, but something was understood by Daniel and the others in Tennessee that had eluded me in my education. I had spent so much time in the classroom and trapped in my own head trying to force myself to think a certain way or feel certain emotions in certain situations that I actually had missed the entire point of the Gospel. Many times when I was full of these questions and full of these doubts, I had thought how great it would be for me to have an opportunity to ask Jesus all of these questions that perplexed and confused me. But now when I reflect on scripture, I think that Jesus would’ve gently rebuked me for being so blind to the purpose of his kingdom. When you read through Matthew 5, Jesus isn’t telling us how we’re supposed to change our mind or what we’re supposed to convince ourselves of. Instead, everything is all about how we are supposed to act as a people. As the body of Christ. He isn’t condemning anybody for having the wrong political belief or incorrect opinion; instead he’s speaking to us on a much deeper level and not just as individuals, but as a community. When you read through Matthew 5 and hear things like, ‘give to everyone who begs from you’ or ‘pray for those who persecute you’, at an individual level we feel helpless to live up to this high standard. But that’s okay. We aren’t meant to follow Christ on our own. As the Body of Christ, we are each intimately connected to each other, and with each doing its part we not only can do more than we could on our own, but we create a community that lives out and embodies Christ’s new transformative reality. “You don’t think your way into a new kind of living. You live your way into a new kind of thinking”. And the way we live our way into this new kind of thinking is by being obedient to God’s instructions for our life and living out his word, TOGETHER. This notion of ‘living my way into a new kind of thinking’ was exactly what I was doing, unbeknownst to myself, in the hills of Tennessee. What had at first looked to me as a space where God was obviously absent, because if he had been there he surely would’ve sheltered Daniel and his family from such devastation, turned into the very space where God most forcefully brought strangers together in love and service to one another. As I have built upon this experience by joining and serving through Brethren Volunteer Service, this mantra of living into a new way of thinking has proved to be consistently true. My views on many things have shifted since moving to Washington and working for the church, but I am always surprised when I finally realize that my thinking has changed, many times without me noticing it right away. You can’t will the reality of God into your life. You can’t force yourself to think and believe differently. You have to go out and live. You have to go out and serve and share with your brothers and sisters that you don’t yet know. You just have to notice that God is already there, working in the spaces where it feels like he is most absent. You just have to acknowledge that perhaps God is already doing a new thing and that he wants you. No, he wants us, regardless of how we all got to this place. He wants all of us to participate in and help bring about the glory of his peaceful Kingdom. To start off the BVS blog, we are focusing on how volunteers have been called to BVS. Read more posts about call or find out more about BVS.